Each year we Marines bear witness to our ancestry and mark our history on 10 November. 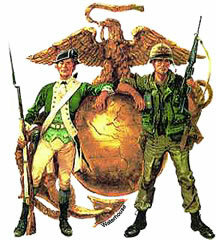 Our antiquity is rich with symbolism and metaphor that emboldens our brotherhood of Marines. So too, we as Marine Interrogators shall strive to identify our core essence and preserve the history of the Interrogator Translator Teams to witness our place in Marine Corps history. Our endeavor to research and write the history of the Interrogator Translator Teams and the Marine Interrogator is vital. We encourage all Marine Interrogators to submit any historical information and their personal accounts. Team Histories, photos, articles, anecdotal accounts and personal histories are all items of great interest and importance. We prefer material to be submitted in digital form, but will gladly convert and return to you any hard copy you may have. We will post these accounts and historical documents to this website and compile a history of the Marine Corps Interrogation field for final repository with the Marine Corps University at Quantico. This is an ongoing project that will be pursued with attention to accuracy, and will be refurbished as time passes and new information becomes available. Although we look for historical fact, the anecdotal stories of those who were there are most vital to the complete understanding of what it was like and what happened. The history of the ITT’s has never been comprehensively recorded. It is incumbent upon all of us to do so with diligence. In the words of Sir Winston Churchill, "History will be kind to me for I intend to write it." So too we must ensure that our history is noted and done correctly by us, lest it be left to those who did not witness it and who would treat us unkindly. Writing history is a guessing game at best, but without such ad hoc judgments, we cannot make sense of the past, of current events nor, most important, of the future. Marine Interrogator-Translators can be traced back to it's roots when the first Interrogator-Translator Teams (ITT's) were formed in 1959. That year saw the formation of the 2d Composite ITT in Camp Lejeune, NC. Force Troop Order 5450.22 established the 2d Composite ITT in Camp Lejeune, NC. Although the formation of the 1st ITT was discussed at this time, it wasn't until 1961 that the 1st ITT was formed under the Fleet Marine Forces Pacific Headquarters (FMFPacHQ) in Hawaii. The roots of the Marine Corps Interrogator-Translator (IT) go back much further than 1959. In fact, Marine linguists can be traced back to before WWI; however, those Marines traditionally known as interrogators were first trained just prior to and during WWII. IT Marines primarily relied on the US Army to provide training to them at the Interrogation of Prisoners of War (IPW) Courses. During WWII this training was provided at Camp Ritchie, Camp Savage, and at The Presidio of San Francisco (among other places, see World War II Interrogator History ). During WWII Marines were not specified by Military Occupational Specialty (MOS) as Interrogator-Translators (IT), but generically known as Intelligence Marines. Those Marines who spoke the language were, by default, tasked to perform the mission of interrogation. It was also at this time that the development of the MOS Language Officer developed. During the Korean War, again, there were no designated interrogators within the Marine Corps and the mission of interrogation was carried out by Intelligence Marines or Intelligence Analysts. Many of them performed this mission through native language interpreters. It wasn't until the Marine Corps' first involvement in Lebanon (in the late 1950's) that the Marine Corps decided to develop a program and MOS dedicated to training linguists and instituting tactical interrogation skills as part of the Marine Air Ground Task Force (MAGTF) concepts then in development. At this time (in the late 1950's and through the 1960's) IT Marines still relied on the US Army for IPW training at Camp Holabird, MD. Although we know that the first two ITT's were formed in 1959, the MOS itself has a murky beginning. It was first designated by the secondary MOS of 8631 Interrogator-Translator (IT). The training for MOS 8631 included that of Intelligence Analyst (MOS 0231), so that all IT Marines were designated by that MOS (0231/8631). The earliest entry of a designator for professional Marine Corps Interrogators is referenced in the USMC MOS Manual 1954 (Revised) which does list "MOS 8631 (W) Interrogator-Translator (Designated Language)". Later, in the early 1960's the MOS became a primary MOS 0261 Interrogator-Translator. The Language Officer MOS was also designated as MOS 0270 at this time. Language Officers typically served as Officer-In-Charge of the ITT's. It was also during this time that the development of Interpreter Teams were developed. Interpreter Teams were linguists not trained in interrogation and held the secondary MOS of 8611. Much discussion was made of these terms (interrogator vice translator vice interpreter) and a determination was made that interpreters were not always to be trained as interrogators. Later, in the Vietnam War, Interpreter Teams were formed to accompany ITT's and provide language support. In some instances these Interpreter Teams consisted of allied troops (i.e. Army of the Republic of Vietnam- ARVN troops). (Note- The designator 8631 later became a Sensor Management Maintenance Specialist and 0261 later became Topographic Intelligence Specialist. When exactly the MOS 0250 and 0251 became the designated primary MOS is still being researched). By the time that the Vietnam War began, the ITT were well established within the combat units. During the Vietnam War the numbers of ITT's grew exponentially. The exact number of ITT's is still being researched at this time, but at least nine ITT's had stood up prior to or during the Vietnam War (1st, 2nd, 3rd, 5th, 7th, 9th, 11th, 13th,15th and 17th). After the Vietnam War, the MOS and the ITT's began to consolidate as the force size grew smaller and more and more the ITT's were rounded up into the headquarters elements under "umbrella" (or parent) organizations of the Marine Amphibious Forces (MAF). These organizations developed into the Interrogator-Translator Units (ITU's) within the Marine Expeditionary Forces (MEF's). The ITT's were formed up under these parent organizations (within the G-2). Training for the IT Marines was done primarily through the US Army Schools (first at Camp Holabird, and then to Ft Huachuca, AZ). In 1989 the Marine Corps established it's own IPW Course at the Navy and Marine Corps Intelligence Center (NMITC) at Dam Neck, VA. It also during this time (1988) that the 0250 disappeared from the rolls of the IT Marines (exact date and circumstances being researched at this time). It appears that the 0250 was the victim of officer realignment conducted at this time. The 0250, being a relatively "young" MOS was one of the first to be removed. In the early 1990's the ITT's became part of the short-lived Surveillance Reconnaissance Intelligence Groups (SRIG's) which formed in each MEF. Within the SRIG Intelligence Companies formed (hence, the formation of Interrogator-Translator Platoons- ITP's- which replaced the ITU). Later, with the dismantling of the SRIG (in the mid-1990's) the ITT's became part of the new Intelligence Battalions within the MEF's. Throughout the 1990's the MOS became severely under strengthen (at one point at 47%). With the advent of the smaller numbers, fewer ITT's were maintained (although not removed from the USMC Organization). Or ITT's were so undermanned that an ITT may have consisted of five people (the normal strength throughout was approximately 12 personnel). This eventually lead to the "ITT" as no longer a reference for Marines. Most of the IT Marines were simply assigned to the ITP and many (even though by T/O they were assigned to an ITT) did not realize they were a member of an ITT. The MOS commonly referred to as "0251 Interrogator-Translator" or "0250 Interrogator-Translator Officer" existed from 1958 until its merger with the 0211 MOS in 2002. The United States Marine Corps Military Occupational Specialty (MOS) 0251 came to an unceremonious end with MARADMIN 560/02 MSG 220730Z OCT 2002 that announced that the “MOS 0251 has been deleted from the active duty component". As we work to research and compile our history there has been established the ITT Listings (see below) to publish the information from the various members of the different ITTs. Please contact Warren Smith directly to add material, or contact me to comment about your experiences so that I can set up a page and/or links to your information. Some information has been submitted and posted at the various ITTs.